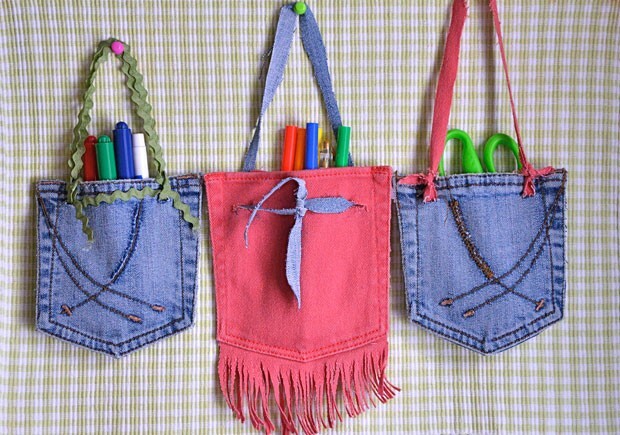 Denim-Pocket Organizers | Project | Kids VT - small people, big ideas! Earth Day, on April 22, invites us to appreciate our planet even more than usual. So this month, we took the three Rs — reduce, reuse and recycle — to heart before choosing a project. We settled on an eco-friendly activity that gives new life to an old pair of jeans. Best part? You most likely already own everything you need for this DIY denim craft. Use scissors to cut a back pocket out of the jeans, making sure to leave the pocket seams intact. To create decorative fringe, leave an extra two inches of fabric at the bottom of the pocket, then slice the extra fabric into strips by making narrow, vertical cuts that stop just below the pocket seam. Make a vertical, half-inch fold in the fabric along the right-hand side of one pocket, then cut a half-inch, horizontal slit about an inch from the top. Cut through the front and back layers but not through the edge of the pocket seam. Then cut a similar slit on the left-hand side of the pocket. Thread a ribbon or another long, narrow length of fabric through the slits to create a strap from which to hang the pocket. Double-knot the ribbon or fabric to close the loop. Use a pushpin to hang the pocket on the wall. Fill your pocket organizers with crayons, markers, scissors, notepaper and other loose craft supplies.